Predicting phenotypic traits from genotypes is a key focus in agrigenomics, as researchers work to increase crop yields and meat production to satisfy the needs of a growing population. Genomic prediction allows these scientists to identify the plants or animals with the best breeding potential for desirable traits without having to endure lengthy and expensive field trials. 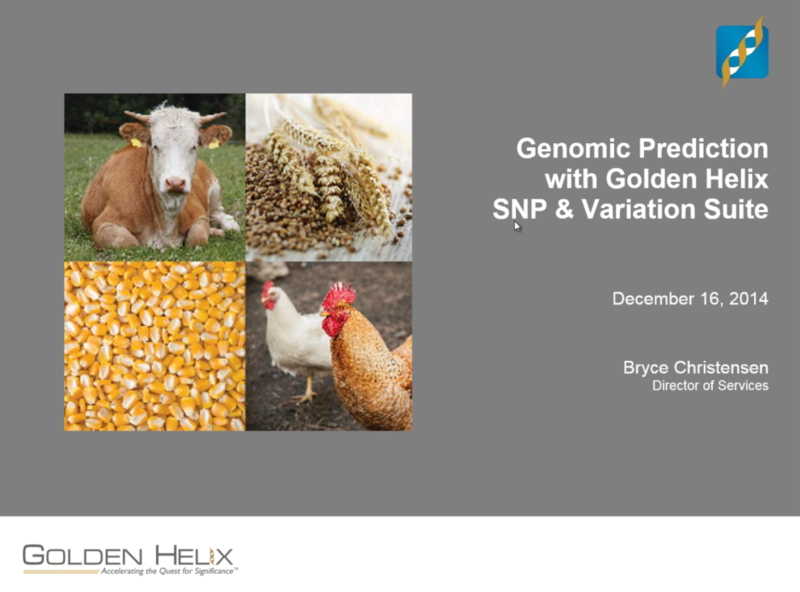 The Golden Helix SNP and Variation Suite (SVS) now offers two methods for genomic prediction: Bayes C-pi and Genomic Best Linear Unbiased Predictors (GBLUP). This webcast will discuss the principles of genomic prediction, describe and compare the methods available in SVS, and include an interactive demonstration of how SVS can be used to predict phenotypes for both plant and animal species.